Despite the American inclination to pretend that the Bush Administration never happened, it did, in my opinion, have at least one genuine major figure: under secretary of State for Diplomacy and Public Affairs, James K. Glassman. He understood the depth of digital culture. Glassman wrote an opinion piece for The Hill today about taking public diplomacy into battle (via @letitiaking). "What’s important is that public diplomacy be strategic — that is, it needs to be placed in the service of specific, crucial ends, such as ousting Syria’s dictator or building civil society in Egypt," he wrote. "Too often, instead, we find public diplomacy trying to make the rest of the world like us better. That’s hard to do." Glassman, shown above in avatar form, gave his last major speech before stepping down in a virtual world called Second Life. My company, Dancing Ink Productions, was commissioned to build the virtual newsroom project. 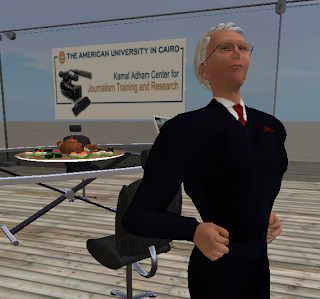 Hundreds of journalists around the world, many of whom were under house arrest or living under threat of violence, were served by the project, even as the media and public continued to mock virtual environments with the familiar "I've got a first life, why do I need a second one?" which is not dissimilar from "I don't need to be on Twitter and know what everybody ate for lunch." Glassman's commitment to the project was incredible, and as a result, he met, long before the Egyptian Revolution, the journalists who would be known for their coverage of it.